To create a Sam’s Club Photo Center account, click Create Account from the main menu of the homepage. 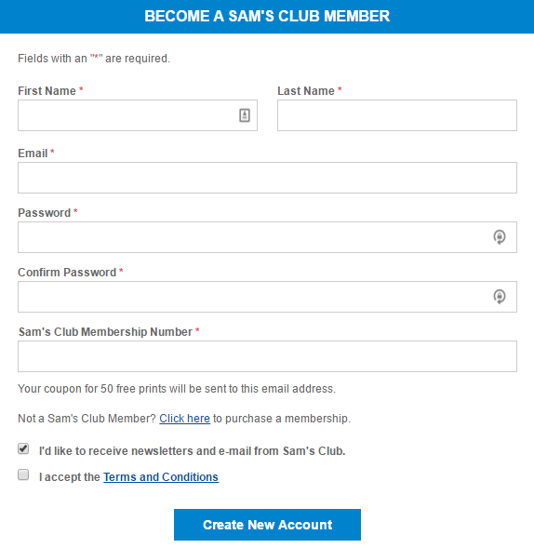 Under the Become A Sam’s Club Member section, enter your first and last name, email address, password, and your Sam’s Club membership number. Check the box to accept our Terms and Conditions, which you can read at any time by clicking the link at the bottom of the page. Then, click the Create New Account button.